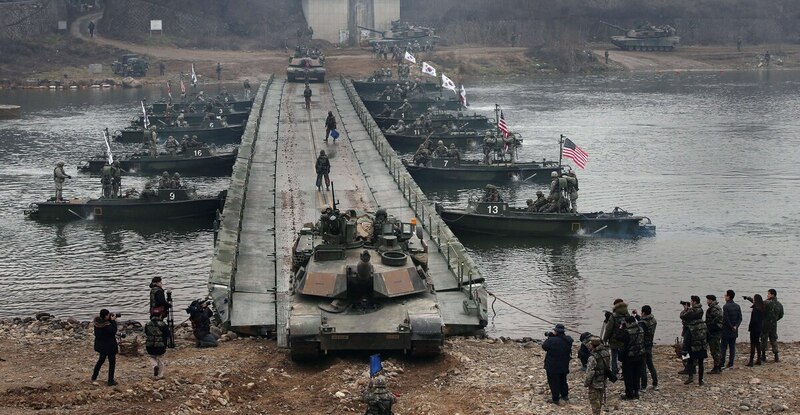 The U.S. and Republic of Korea have been working to negotiate a deal regarding how to share the cost of hosting the more than 28,000 American troops based in the country. And while the negotiations have failed to reconcile differences over the past year, the halt in funding won’t impact military operations, though Korean workers on U.S. bases may be put on leave this spring. The Wall Street Journal reported in December that President Donald Trump wants South Korea to pay up to double the current amount — between $1.2 billion and $1.6 billion per year for five more years. South Korean officials are opposed to the increase, the Journal reported, and the two governments are not close to an agreement. The negotiations are over the Special Measures Agreement, or SMA, a five-year contract between the U.S. and South Korea that expired Dec. 31. The agreement previously required South Korea to pay about half of the estimated annual cost of hosting U.S. troops, or roughly $830 million per year. “There is currently no impact to military operations,” Pentagon spokesman Lt. Col. Chris Logan said in a statement to Military Times. “Both sides seek a swift conclusion to SMA discussions to mitigate a possible lapse in contributions that directly support compensation for nearly 9,000 members of the [U.S. Forces Korea] Korean workforce." In preparing for a possible lapse in SMA funding, U.S. Forces Korea notified the ROK Ministry of Employment and Labor and Korean Employees’ Union of the timeline for a potential furlough on Nov. 7, according to the Pentagon. Reuters previously reported that the U.S. military warned Korean workers that they may be put on leave in mid-April if no deal is reached. Since 1991, South Korea has helped offset the costs of stationing U.S. forces through the SMA mechanism, according to the State Department. The current agreement has been underway for the past several years. Rotating U.S. troops have been posted in South Korea since the 1950 Korean War.